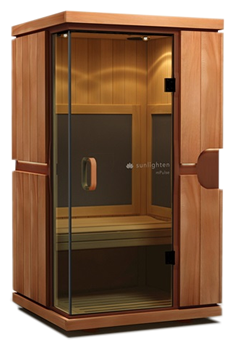 Core Value Fitness boasts an infrared sauna that is available to hire by gym members and non-members. Saunas have come a long way since the days of hot rocks and steam. Now a sauna is an experience everyone can enjoy. Whether you like it hot or prefer gentle warmth, our sauna will have you covered. The full infrared spectrum consists of near, mid and far wavelengths—all of which provide different health benefits. They work by using infrared light – the invisible part of the sun’s spectrum you feel as “dry-heat” (without the UVA/UVB rays). They’re extremely safe – what hospitals use to warm babies. Far infrared rays have the ability to penetrate human tissue at the cellular level where most of our toxins reside (inside the fat cells). Scientific analysis has shown that sweat produced from infrared saunas is about 80-85% water and the remaining 15-20% consisted of toxins such as heavy metals, sulfuric acid, sodium, ammonia, uric acid and other fat-soluable toxins. Compared to a traditional sauna which is 97% water and 3% toxins. 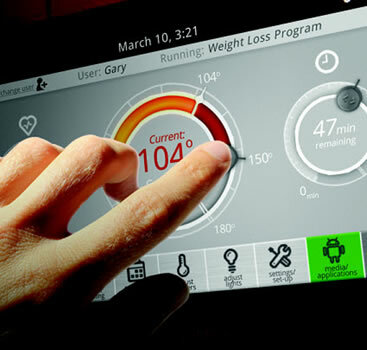 The length of your sauna session experience depends of which program you select. With near infrared coming on and turning off at different periods through the program. Begins with a low constant intensity level of far and near infrared wave lengths which penetrate tissue improving overall skin tone, elasticity and firmness. Starts at a high intensity to stimulate the cardiovascular system then reduces to a medium level. As the body works to cool itself, there is an increase in heart rate and cardio output and metabolic rate similar to exercise. To book a Sauna Session please contact the office. A minimum of 30 minutes notice is needed to heat it. You are required to bring two towels and a water bottle. Sessions are available to members at any time day or night. Non-members would need to use the sauna during office hours. Bookings can be made with the office during business hours. Please be aware that there are medical warnings in place in regards to your health and using the sauna. Please read the document and adhere to anything that affects you. Throughout my life I have been fairly active, working hard and often long hours on the farm and as a contract shearer, also playing various physical sports. Now as the years have rolled on I'm still interested in endeavoring to keep reasonable fit not only for my own good but to be there for my family in a caring and physical way for as long as possible. At Core Value Fitness Centre, after being interviewed, a schedule of exercises was recommended to best suit my needs in particular my sense of balance were very poor and my legs weak and incapable of stepping up properly - like onto a ladder. Through Paula and Leonie, their persistence, guidance and cheerful manner, my balance has improved greatly. My legs have regained strength and somewhat bodily "toned up" overall. The social part is friendly too.